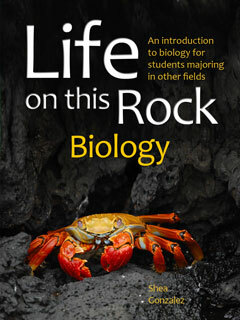 Life on this Rock is the ideal textbook for high school biology because it is designed with both the student and the teacher in mind. 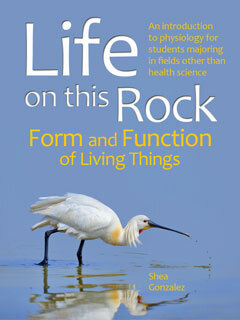 For the student, Life on this Rock is written in student-friendly language, making complex processes more accessible. Each unit of study contains essential questions, which will provoke your students to think and explore the very nature of biology. The student-learning outcomes, written as “I can” indicators, let the student take charge of the learning process. This is a marked difference from other biology textbooks, which phrase student learning outcomes as “Learning Objectives.” As educators, Shea and Gonzalez recognize that the learning process is never finished, therefore, learning outcomes should not be expressed as restrictive, finite goals, but rather should be a springboard for further exploration by the student. 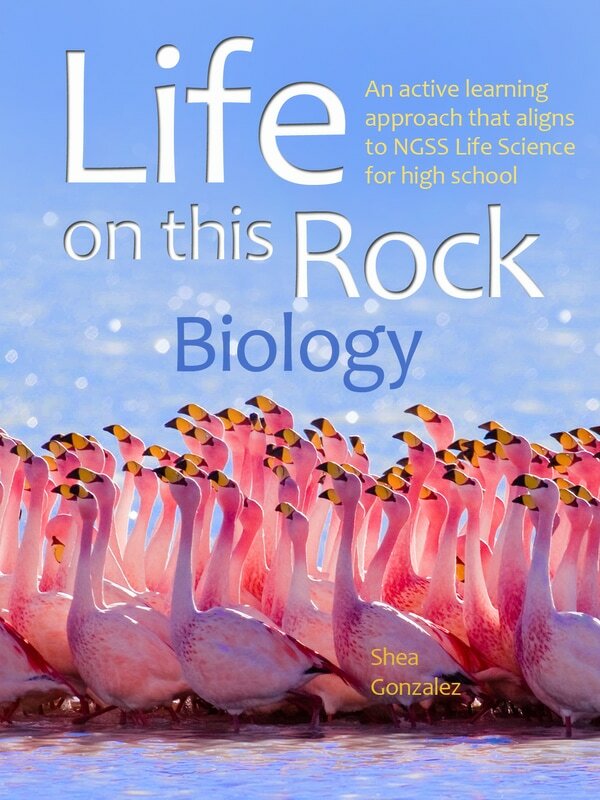 For the teacher, Life on this Rock Biology – High School Edition contains supporting materials centered on the five themes of the NGSS Life Science Standards, as well as the Science and Engineering Practices (SEP), Disciplinary Core Ideas (DCI), and Cross-Cutting Concepts (CCC) of the performance expectations. 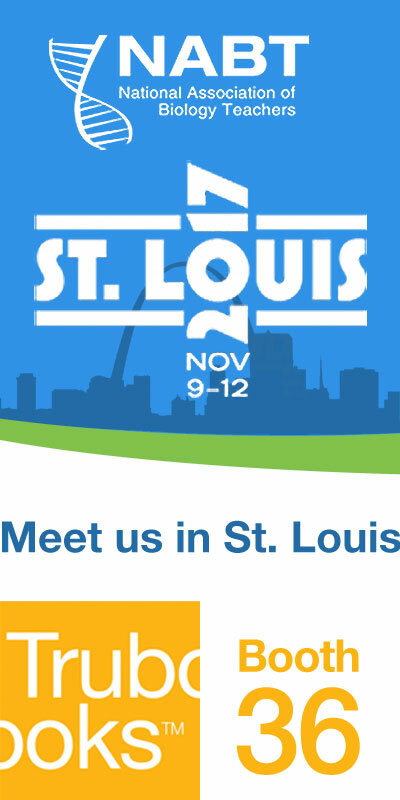 We will be featuring Life on this Rock: Biology at the NABT Conference on Nov 9-12.. The text is written in a narrative style, reminiscent of a documentary, which improves readability and comprehension for students. Not only does approach better engage students with diverse interests, it also provides instructors new to teaching this course a ready-made “script” for class lectures. 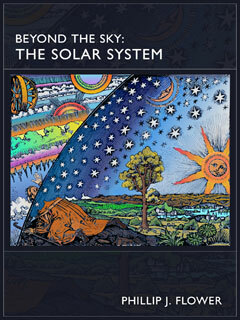 A complete course, ready for immediate use, but customizable as desired with over 750 Power Point lecture slides featuring all text figures as a downloadable supplement and over 500 illustrations and real-world examples. Instructors can easily customize the textbook for their course, re-arranging the learning sequence, adding their own content, removing unneeded items, and even mixing/matching with content from other Trubook textbooks. “Claim, Evidence, Reasoning” and review sheets to improve scientific analysis and academic writing skills, and Laboratory Exercises to foster science and engineering practices. All of these adhere to and reinforce core NGSS Life Science Standards. To improve the academic success of English Language Learners and native speakers, alike. Test banks and online gradebook: includes test bank of quiz/exam multiple choice, true-false and short-answer questions, over 500 questions in all. Simply select the chapters and numbers of questions and the bank generates tests that are delivered to students with the assessment engine built into the book; an Instructor’s Gradebook tallies all scores from assessments and assignments and maintains a running average. Questions can be identical for each student or automatically randomized. ​Built-in glossary and highlighting/annotation tools: your student will appreciate the convenience of click on key words the first time it appears to get definitions and the full searchable glossary appearing at the end of each chapter. Students can easily highlight text and add their own annotations. Cardiac Muscle: Can’t You Hear My Heart Beat? How do we distinguish “Self” from “Not Self”? 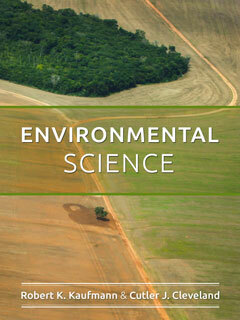 Ecosystems: Who Lives Where, and How? Life on this Rock is the ideal textbook for high school biology because it is designed with both the student and the teacher in mind. 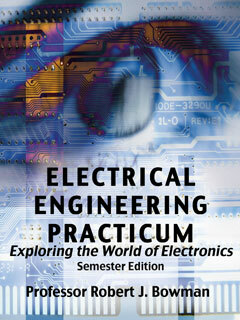 For the student, Life on this Rock is written in student-friendly language, making complex processes more accessible. Jargon and unnecessarily complex terminology is kept to a minimum so that students can focus on understanding the core concepts. The narrative style of the the text also gives instructors new to teaching the course a ready-made “script” for class lectures. Each unit of study contains essential questions, which will provoke your students to think and explore the very nature of biology. The student-learning outcomes, written as “I can” indicators, let the student take charge of the learning process. This is a marked difference from other biology textbooks, which phrase student learning outcomes as “Learning Objectives” As educators, Shea and Gonzalez recognize that the learning process is never finished, therefore, learning outcomes should not be expressed as restrictive, finite goals, but rather should be a springboard for further exploration by the student. 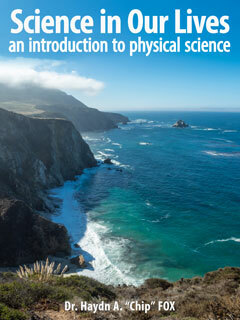 For the teacher, Life on this Rock – High School Edition contains supporting materials centered on the five themes of the NGSS Life Science Standards, as well as the Science and Engineering Practices (SEP), Disciplinary Core Ideas (DCI), and Cross-Cutting Concepts (CCC) of the performance expectations. 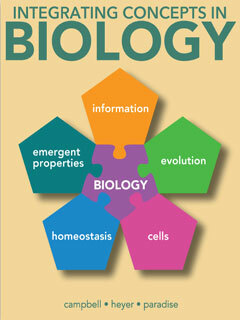 Life on This Rock – High School Edition, was designed to align with all five of the Next Generation High School Life Science Standards: 1) Structure and Function, 2) Inheritance and Variation of Traits, Matter and Energy in Organisms and Ecosystems, 4) Interdependent Relationships in Ecosystems, and 5) Natural Selection and Evolution. As a result, you are presented with a textbook containing only the relative content needed for students to meet NGSS performance expectations by year’s end. 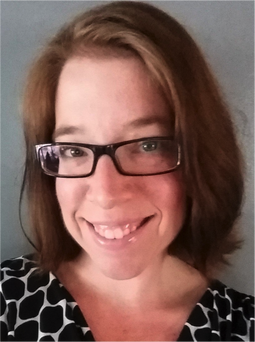 Life on this Rock – High School Edition, and its supporting materials, will aide students in demonstrating mastery of the subject matter through the use of Science and Engineering Practices (SEP), Disciplinary Core Ideas (DCI), and Cross-Cutting Concepts (CCC) – the foundational tools of NGSS. 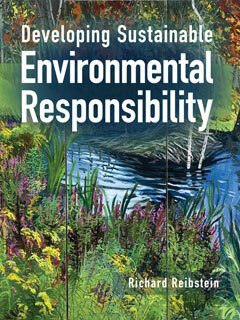 The supplemental materials included with this textbook will foster critical thinking and improve the student’s science skills. The Essential Questions embedded in each chapter will allow for productive classroom discussion, and will also let students observe the cross-connections within the NGSS High School Life Science Standards. Review sheets for each unit, along with claim, evidence, reasoning (CER) prompts, will help students improve their scientific analysis and academic writing. 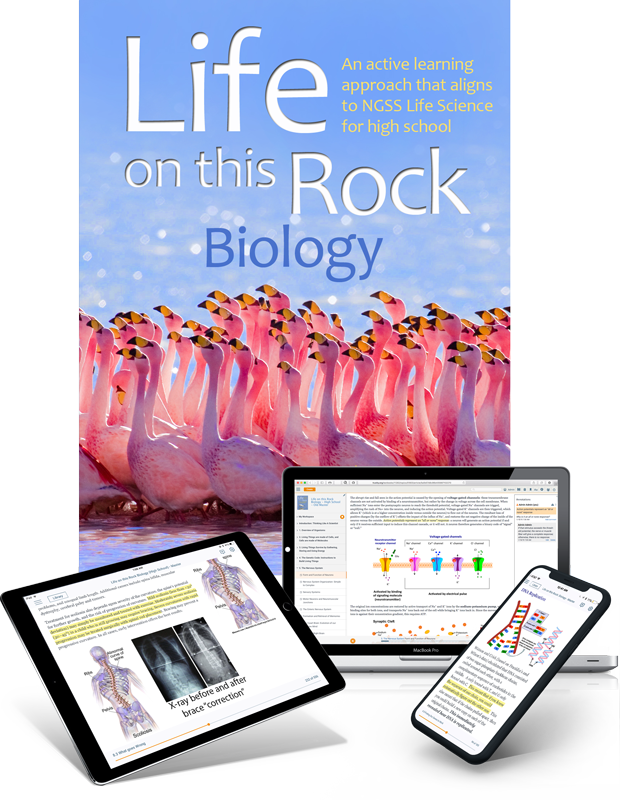 Life on this Rock – High School Edition laboratory exercises will give students the science and engineering practices necessary for mastery of the NGSS Life Science Standards. 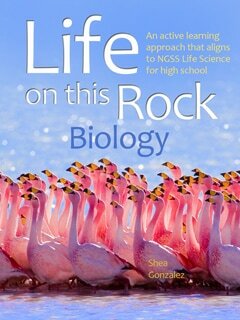 Finally, Life on this Rock – High School Biology edition also contains sheltered English-immersion (SEI), vocabulary, reading, writing, and speaking strategies, which will improve the academic success of your English language learners, as well as your native English speakers. 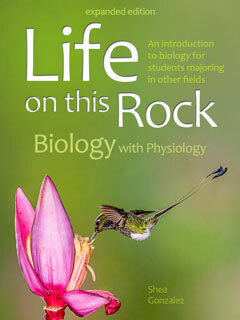 The chapters in Lift on This Rock – High School edition seamlessly glide between micro and macro themes, allowing easy integration into your school’s biology curriculum. On a day-to-day basis, the essential questions, student “I can” descriptors, and Sheltered-English Immersion (SEI) activities can be used as “Do Now Science Starters”, getting your students ready for the day’s learning. These items can also be used as “Exit tickets”, giving you valuable feedback about where your students are in their mastery of the content. Included laboratory exercises will get your students doing science, giving them to the opportunity to visualize the concepts they are learning.